Fans are an essential prop in nohgaku. Fans are constantly with the performers, whether performing Noh in costume, in montsuki-hakama dancing mai hayashi or shimai, in separate costumes singing suutai with their utaibon in hand, on stage or in practice. Particularly on stage, every part including the shitekata, wakikata, hayashikata and kyōgenkata always have their fans in hand. Ōgi have a wonderful history, and in Kyoto, which remains the fan-making capital, fans that add an air of beauty or taste to the scenes of Noh are specially made and hand-delivered by the fan maker to the performer. One of these fan makers is Tomatsuya Fukui Senpo. We visited the shop, in the centre of Kyoto and spoke to its owner, Yoshihide Fukui, about Noh and Japanese fans. Mr. Fukui opens a neatly folded fan, and as if to revealing its beautiful face, shared with us many interesting stories about the development and beauty of the culture of Japanese fans. His earnest manner of explanation conveyed the air of a true fan master. Even after the scheduled time for the interview was over, Mr. Fukui continued to speak with us in depth about the world of Noh and ōgi, and the day turned out to be a rich experience. official performance style of Noh,gobandate. Used to cool off in hot weather, the uchiwa, or screen fan, came before the ōgi, or folding fan. Screen fans were common throughout the world. They are believed to have existed by the Zhou Dynasty in China (through the third century A.D.) and were painted on the tombs of Egyptian pharaohs. Screen fans were also thought to ward off evil, and were used in ceremonies and to shade noblewomen. It is believed that screens fans were brought to Japan in the sixth or seventh century. They were initially used in religious ceremonies, in the Heian era to shade nobles, and as insignia used by feudal lords during the Warring States period. Now, ōgi are a Japanese original. What is original about them? The character for ōgi means uchiwa, and is used to indicate something opening and closing like a door. Japanese fans were originally called, augi, derived from the Japanese word aogu, “to fan,” and were always designed as functional objects. A thousand or more years ago around the start of the Heian era, instead of paper, which was quite valuable at the time, long, thin pieces of wood called mokkan used to keep written records were pieced together to make fans. The first ōgi were called hiōgi and later they became beautifully painted. After that came ōgi with pasted paper (kawahori) and fans made of folded paper. In the later part of the Heian era, highly decorative fans with engraved bone (sukashiōgi and kirisukashiōgi). I think that inventing a fan that opens and closes is a very Japanese thing to do. Fans from the five shitekata schools and the“school-less” fans. Japanese fans (wasen) of the Kamakura era were brought to China by Zen monks and resulted in large changes in the way fans were made. A way of making fans in which paper was attached to both sides was invented, which was then brought to Japan. Interestingly, chūkei, or suehiro (used in formal performances of Noh) were created based on the influence of cultural exchange with China. In addition to the original fans (shizumeori) and chūkei, the bonbori was added, and these three styles became established in Japan. Fans created in Japan made their way from China to India and Europe, and also influenced the culture of the Louis dynasty in France. In Spain, which played the role of brining fans to Europe, they were used as hand props in Spanish dance. From the late Edo era onward, fans began to be exported to the rest of the world as examples of Japanese art. They also gained great popularity after being exhibited in the 1901 Paris World Fair (Meiji 34). From the Meiji era until before the start of the Second World War, twice as many fans were exported than were sold in Japan. While fans are of course primarily used to cool off, they are also used as a tool to create a “ borderline.” If one sits facing one’s customer or teacher and places the fan in front of oneself, this shows humility in that it lowers one’s standing. In this way, the fan is the line that demarcates social relationships, placing the person across the line in higher standing. With the fan, this borderline is movable. Holding the fan also renews one’s spirit. This is not limited to Noh, but also extends to the tea ceremony, and was closely connected to everyday life in years past. So, why are fans used when performing Noh? Strangely enough, it is similar to a baseball glove in that the fan makes the hand appear larger. With only the hand, it is difficult to see what the performer is doing. This is to make the forms and actions more understandable, and I certainly feel this way when watching Noh. Scholars studying folklore say that the fan also serves like an antenna to be possessed in a religious ceremonies. I agree that they certainly also serves this function. There are different uses in kyōgen also, such as to accentuate the act of drinking sake or as a pantomiming tool. This is similar to rakugo. In the maigoto of Noh, the use of fan movements are used as signals to the hayashikata between scenes. From what I have been told by nohgaku teachers, in the haya mai of Tōru, there is an alternative form known as jyuusandan no mai (thirteen-step dance), and during a certain part of this dance the fan is used to give directions to the hayashikata. The shite acts as the conductor, and the fan as the baton to give instructions. The convenience in the opening and closing of a folding fan means it can be used to express more forms and actions. While we do sell fans, we are particularly proud of the fans used on stage. We are very thankful for these fans. Regular fans are used only in summer. We would prefer if our customers forgot about their fans and bought new ones every year (laughingly). Fans are usually thrown away when the season passes, but the fans used on stage are treated with special care. Those of us who make the fans are very thankful for this. This is something I feel strongly. 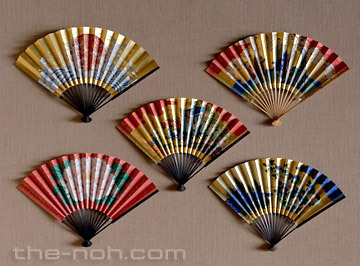 We deal in fans used for each school of Noh and kyōgen. While the basic elements such as the ten slats do not remain the same, fans used for performances differ in the structure of the slats and pattern, and by school. Although I won’t go into detail, looking at the fans used by the five schools, you will see the unique characteristics of each. It is quite interesting. The fans of the waki, hayashikata and kyōgenkata also differ. However there are some basic similarities – the structure of the shitekata Konparu School’s fan is almost the same as that of the kyōgenkata Ōkura School, and the fan of the wakikata Fukuō School almost the same as that of the shitekata Kanze School. The pattern of the chūkei used in Noh was decided at the end of the Edo era by the type of play being performed. Keeping this in mind when going to see a play, it is interesting to clearly see the differences in the styles of the different schools. Take for example the fans used in Dōjōji. Kanze school fans have a peony pattern; Hōshō School fans have a dragon pattern, and Konparu School fans have a circular pattern of seven flowers. The Kongo school uses the pattern of the family crest taken from the Ōuchi clan, one of the daimyōs of the Warring States era. The Kita School now uses a cherry blossom pattern. This is how different the patterns are. Even a fan with a similarly designed pattern may be used in different styles of scenes depending on the school. For example, the rust-colored yuengata pattern (a Japanese decorative element), is the set pattern for fairies and demons, and the pattern is used in Shōjō Midare in the Kanze School. However, in the Hōshō School it is used in Tōru. But in the Kanze School, an autumn-grass pattern is used in Tōru. Tōru used to be a play about demons. 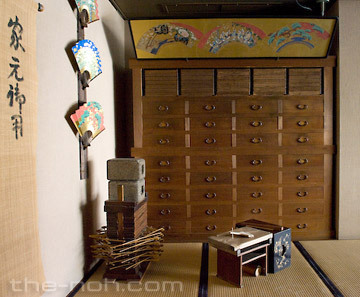 Because of that, it was natural to use the rust-colored yuengata pattern in Tōru in the Hōshō School. It is interesting that, when times changed and the play could no longer be called a play about demons, in the Hōshō School, the old style remained in the fans. While there are many traditions, as the fan is essentially a prop it also changes based on the performer. Before a performance of Noh, first the masks and costumes are chosen, with the fans chosen last. There are certain times at this point when the selection of the fan breaks with tradition, with the decision made based on overall balance. Certain creative performers will create new designs, and for there are many new patterns for newly created Noh plays. We also create these kind of fans. At our store, we conduct our business as craftsmen and merchants. As the president, I handle sales and management, and my uncle runs the actual production. There are five people including my son who make the fans. We have a very streamlined operation. While the shop may seems like a cottage industry, we actually have very specific division of labour. We receive orders from our customers, teachers of Noh, then begin to form the structure of the slats of the fans, the paper process and the decorating of the paper. This includes the application of gold leaf and painting the paper. Then comes the folding process to create fold lines, in other words the assembly process in which the slats and folded paper are put together into the shaped of a fan. At this point we outsource all of the painting of the faces of the fans. This process involves many specialized tasks, and it is our job to put them together. We are not limited to creating only existing or new patterns or making new fans, but are also largely involved in restoration work. This is a difficult job, and we are always making new discoveries and learning new things. We receive orders to renew old fans, and sometimes make copies of extremely damaged fans or those that are not worth restoring. The problem that arises here is that the measurements used for chūkei are different in the period before the middle of the Edo era and from the latter part of the Edo and Meiji era onward. We could call today’s chūkei “modern Noh chūkei.” While the number of slats is the same, the distance between the slats gets narrower as the fans get older. Slats on chūkei from the Genroku era may be set at as much as 50 to 60 degrees. We sometimes receive orders from teachers to resize fans to bring back the old style of fans in modern performances. The entrance to the shop facing Karasuma Dōri. Our shop was founded some 300 years ago in 1703 (Genroku 16). We began by buying the right to handle fans for the Kanze School. During the period of crisis for nohgaku from the Meiji Restoration, this business also faced challenges, but with the revival of Noh toward the end of the Meiji era, new progress was made. Ihē Ejima, the owner of the Tokyo nohgaku specialist publisher and book shop, Wanyashoten, went looking for a fan maker in Kyoto and visited our shop. We were then fortunate enough to receive his business. 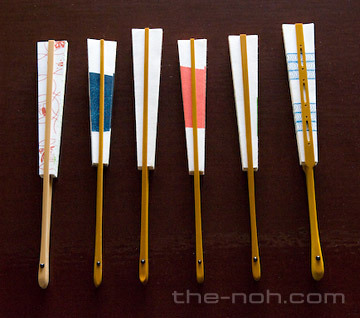 As Wanya makes the chant books for the Hōshō School, they sell Hōshō School fans. We began to handle the production of these fans. We are what you would all an OEM (“original equipment manufacturer”). Wanya creates sales roots for us in Tokyo, and even now they handle the sales, and we handle the manufacturing. We also began doing business with Hinoki Publishing, which handles chant books for the Kanze School. Ihē Ejima of Wanya, who I just mentioned, was full of great ideas and held an exhibit of Noh-related objects during the start of the Taishō era which greatly benefited the world of Noh. At the time, we were also able to place many of our fans on exhibit. Lately more and more shimai and kyōgen workshops are being opened at elementary and middle schools. As the number of people practicing Noh is decreasing, this trend is being welcomed with great thanks. Many of these workshops begin with shimai in the first year and move to kyōgen in the second year. While it would be nice if they continued with the same school, many times this is not the case. From this trend, the idea of creating fans that could be used for any school was born. While there was concern that this idea was unwise at first, the idea that an easy-to-use fan would help popularize nohgaku won out. We consulted with the teachers of nohgaku, and on the premise that it would only be used for children and students, received encouraging words and were able to keep the cost under control. The “school-less” fans were then provided as an option to those holding individual workshops. By increasing the choices and convenience for those holding the workshop, we hope to help more people come to the world of Noh and kyōgen. The decreasing number of nohgaku practitioners is truly a serious problem. It is also affecting the creation of the objects used in nohgaku. While our job as fan makers is not very technically challenging, we have to produce in number to make truly high-quality pieces. Craftsmen also do not become famous immediately. They begin by making many fans used for practice and build their skill. After acquiring these skills, they are then able to make high-level pieces desired by professionals. Fan making is a serious and honest process – the accumulation of numerous tasks. You will only get better after making many fans. However, we are starting to face circumstances where this is not possible. This problem is also affecting the bamboo that is used as a material for fan slats. If there is appropriate demand, the bamboo is properly pruned and maintained, but if demand fades, it grows wild. Even good quality bamboo grown in cold climates is being forced to the top of mountains due to global warming. This is the situation we are faced with. There are many problems, and this is why we hope more people will practice nohgaku. We have put together the stories we were not able to introduce in the main section here. Born in 1949 in Kyoto, Yoshihide Fukui graduated Osaka City University in 1971 and joined his family business Tomatsuya Fukui Senpo, a maker and seller of fans for Noh and kyōgen founded in 1703 (Genroku 16). In 1992, Fukui became President of the company, the position he holds today. From 1993-2008 he acted as the Chairman of the Kyoto Fan Makers Association, and has held positions as the Chairman of the Traditional Crafts Industry Organization and as a member of the Ministry of Economy Trade and Industry’s Traditional Crafts Industry Committee. 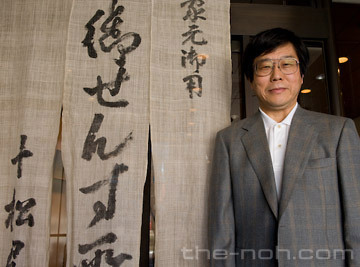 He currently serves as the Chairman of the Gion Festival Committee. In spring of 2007, he received the Yellow Ribbon decoration from the government of Japan.